Sweetly B Squared: Disney on Ice: Let's Celebrate! Are the ‘blahs’ of winter getting to you and your little ones yet? I’ve got just the remedy! I just found out there’s a Disney on Ice show coming to the Detroit area February 24 - 28! 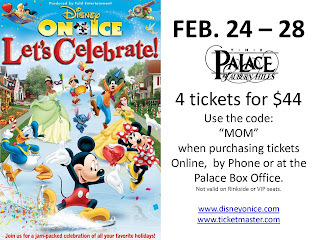 You can check out ‘Disney on Ice: Let’s Celebrate’ for just $44 for four tickets – use the code MOM when purchasing tickets online, by phone or at the Palace box office (not valid on VIP or rinkside seats). Tickets go on sale today! The show description reads: It’s one colossal party on ice, with all your favorite Disney friends! Join Mickey Mouse and Minnie Mouse as they celebrate a Very Merry Unbirthday Party with Alice and the Mad Hatter; a Royal Valentine’s Day Ball with the Disney Princesses, including Cinderella, Ariel and Tiana; a Hawaiian luau with Lilo & Stitch; a winter wonderland with Woody and Buzz Lightyear from Disney/Pixar’s Toy Story; a Halloween haunt with the Disney Villains and more in a magical medley of holidays, celebrations and festivals from around the globe. In exchange for passing along the discount information about this show, I’m receiving four tickets. Hope to see you there! That's always a good time. Look like fun to me!